So Lonely in Gorgeous: A Hazy Shade of...Purple? Addiction by Ayako 'Purple Haze' Nail Lacquer. A Hazy Shade of...Purple? Addiction by Ayako 'Purple Haze' Nail Lacquer. I've raved about Addiction's beauty products, but I have yet to rave about the brand's stellar nail lacquers...and stellar they are! 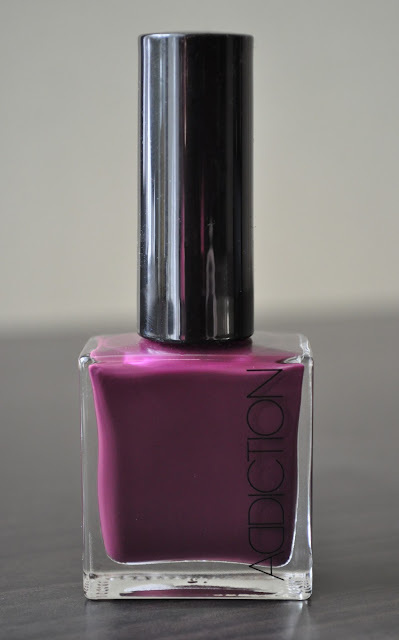 Purple haze 026 is a glossy, red-based grape purple cream. Opaque in two coats, I really love how smooth these polishes feel on my nails. Although, some of the shades in the lineup may not seem terribly original, the formula of Addiction's nail lacquers apply and perform wonderfully. The brush fans outs in a way that it provides an easy, and even, foolproof application. These polishes have a beautiful glossy finish that doesn't require a top coat, and wear for 4-5 days without any chipping...SUCCESS! Addiction Nail Lacquers retail for ¥1,890($20.93), and is exclusively sold in Japan. What are some of your favorite purples? I wish I could send you a few of these polishes, because they're AMAZING! !